We are going to let you treat yourself to a little prize! Entry #1 - Sign up to follow us (remind me if you already are). Entry #2 - Post about this give-a-way on your blog with a link to our page. Entry #3 - Get a friend to follow our blog. Entry #4 - Let us know what your favorite products in the shop are! Just leave all entry's as SEPERATE comments below and you could win!! Dont forget to leave your email address so We can contact you if you win! Contest closes Nov 6th! Get goin! Hi! I've been following! I really like these necklaces, and I think they are my favorite of the products you have in your shop! I love the cluster headband and the Bella necklace. If I had a little one I would be all over your onsies. 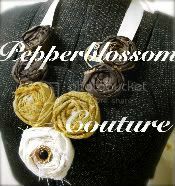 my fave is the fall bliss rosette necklace! I love the framed magnetic boards... such a variety. I love the yo yo headbands! I looove the rosette necklaces! A friend of mine was wearing one and thats how i found out about your site!! dnwynn@msn.com Thx! Love this necklace. I already follow you! Your rosette necklaces are awesome! already following. i've been in love with you back in the wee days of like..5 followers. thanks to dear ol' brooke. that necklace is to die fooor. sorry i combined them into one. I am now a blog follower! Bella Rosette Necklace AND the Rosette Cluster Headband with Pearls. Such lovely pieces! Thank you. I LOVE the Bella Rosette Necklace as well as the Mary Antoinette! I really like the magnet board! Its so cute. I am now following you! I would love to win. I am now a follower of your blog, and I love it! My favorite products are definitely these necklaces. I saw them a couple weeks ago, and I want one so bad...soooo cute! i posted on my blog about your giveaway-choose me! I love the Bella Rosette Necklace! The Rosette Neclace's are my FAVE!!!! I like the blue and pink minkys. I am a follower! Thanks for a chance to win! A new follower you've made out of me with this cute necklace...love it! What cute things! I love your blog! Thanks for sharing! I got my friend Aubry Tucker to be a follower so add another entry for me! hi! im a follower for sure. got a friend to follow...yay!!! I love your style, I am a brand-new follower! It is so hard to choose a favorite, but I love your choices of magnet boards. Your headbands, necklaces and onesies are my fav. So cute! I'm a follower! Just checked out your shop and LOVE the big, statement necklaces (like the Bethany) - that's why we want to win the lovely one you are giving away! I'm a stalker... oops, I mean follower... that's one! anne molino at hotmail dot com! Seriously, my fav product are these necklaces... I absolutely love them... that's #2. Oh and my blog post is here: thesesweetmoments.blogspot.com... that's #3!